Every now and then when trawling ebay for some good old fashioned Hong Kong goodness, something amazing reaches out and hits you in the face. Usually the fist is in the form of rampant lunacy, and guess what? Today, this very afternoon the fist of crazy found me with a knockout blow. 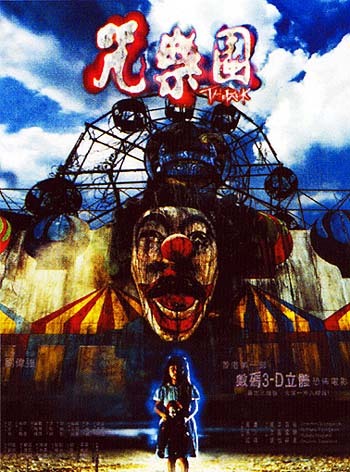 In 2003 director Andrew Lau made a horrible horror ( and I say horrible in the true sense of the word) movie called The Park, it made a tiny splash as it had a few sequences that were 3D before 3D became as popular/unpopular as it is today. Lau really should have known better but the film was released to almost universal derision before limping out on dvd. A. Throw it in the bin. B. Try and donate it to charity. C. Put it on ebay with a buy it now price tag of $250 ? 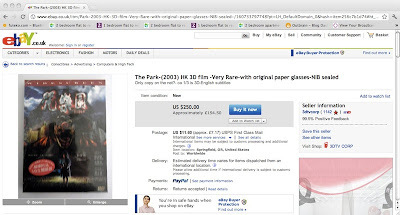 If you're ebayer 3dtvcorp you choose C, congratulations on easily one of the most stupid ebay listings I've ever seen. Here is the link to this madness, if you're seeing this too late to see the listing, here is a screencap. If you're considering taking advantage of this once in a lifetime offer, wait! You can have my copy for $200. lol, this movie was SO bad. Eric, It really is one of the worst I've ever bought. Michael, Does adding rare to a listing really make anyone more inclined to bid/buy? A little shopping research is important these days, especially where HK movies are concerned. Wes, I don't take cheques anymore but Paypal will do!